Thread: Paul hub's = no chain tensioners? My dad seems to think even with the legendary sticking power of Paul Hub's that I will still need chain tensioner's w/ sliding dropouts. He just doesnt believe me. Can someone confirm my suspicion that I am right and he is wrong. Oh, pictures would be awesome too. if you have sliding drops or horizontal drops you don't need a tensioner or a chain-tug. doesn't really have anything to do with whether it's a paul's hub, more to do with the fact that you can achieve the proper tension and crank everything down keeping it all from moving. chain tensioners are only needed when there is no device/mechanism for tightening the chain, i.e. eccentric bottom bracket, eccentric rear hub, or horizontal dropouts. if you have either of the three, you do not need a tensioner. a chain tug is never actually needed but it makes life easier. with that said, i don't use a chain tug on either of my SS bikes. i was just checking. i have track drop outs (horizontal) and i am sick and tired of chain tugs, but my dad still thinks you need them. what ever i will prove him wrong once i get my new wheelset. Ahhh...damn dads! What do they know? I remember way back when life was good and I knew everything. With a bolt on hub properly installed you probably won't need a tensioner if the drop outs are resonably thick (not a stamped frame like some old and some new cheap bikes like a Huffy, Murray, RoadMaster, etc.). The only exception I can think of is if you have chromed dropouts since the chrome tends to be slippery, but that is pretty rare on mountain bikes. it's a bianchi muss with the retro old school paint job on it. i hate saying that i love the bike but i do. i haven't found another bike i like as much. unless i could afford a custom soulcraft or spot. Matt from soulcraft is a riding aquatience but he won't cut me a deal on a frame. DAMN, now i need to finda decent paying job. something other than ski instructing. Your Bianchi is fine and lusting after something 'better' is a never ending addiction. When you can spank who ever you ride with on the Bianchi then reward yourself with the new bike. Otherwise replace only what you break or wear out. Bet you never thought you would hear that from a bicycle mechanic. i spank everyone on my bike, and i don't want another bike unless i can get a custom bike. i just spent several hundred dollars on new parts. i plan on riding and racing the frame as long as possible. You might need one. I could never get the aluminum axle to bite into the Ti track ends. I had Paul hubs on my Voodoo Nzumbi (horizontal track style droupouts) with no chain tug and they never slipped. Not once. Hey, I just posted a pic in another thread when I saw you had a q. This is a White Industries hub. I have an MKS chain tensioner combined with the bolt-on rear hub (stock hardware). The MKS chain tensioners are made in japan and designed for track ends or as commonly miscalled 'horizontal dropouts': The pic is of a Bianchi SASS, also the infamous ano green Trials 18T White Industries freewheel. Sidenote: The stock tensioners were like old bmx kinds (rectangle with a bolt and nut) that are a) clunky b) poor performing. There was one on both sides. In addition the Spot rear hub (stock on the sass model for 2004) kept slipping, it was awful. The chrome finish on the frame didn't help. 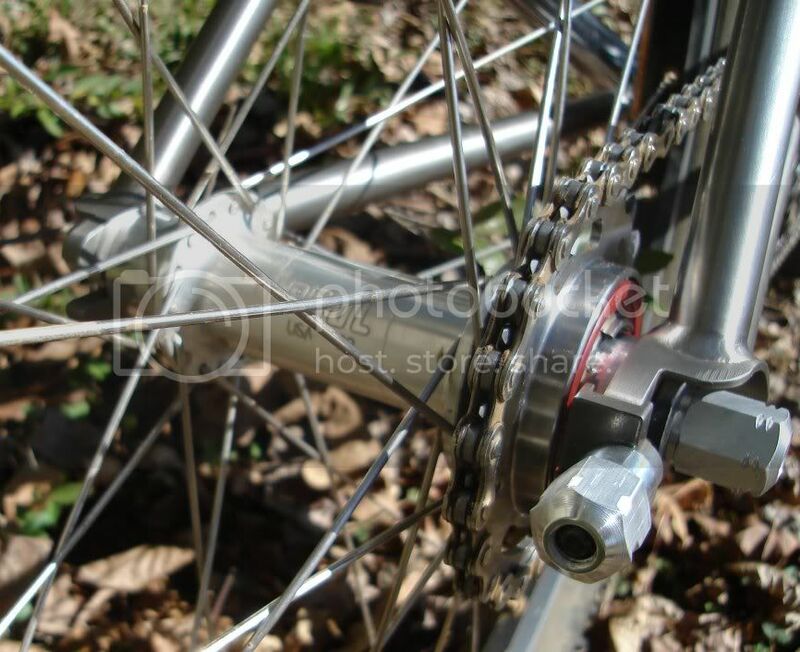 The WI rear eno hub hardware was super burly, in fact, you dont need chain tensioners but I was always paranoid and got the MKS. The two combined, 99.9% no slippage. Yeah, I'm bumping an old thread. Wanna fightaboutit? 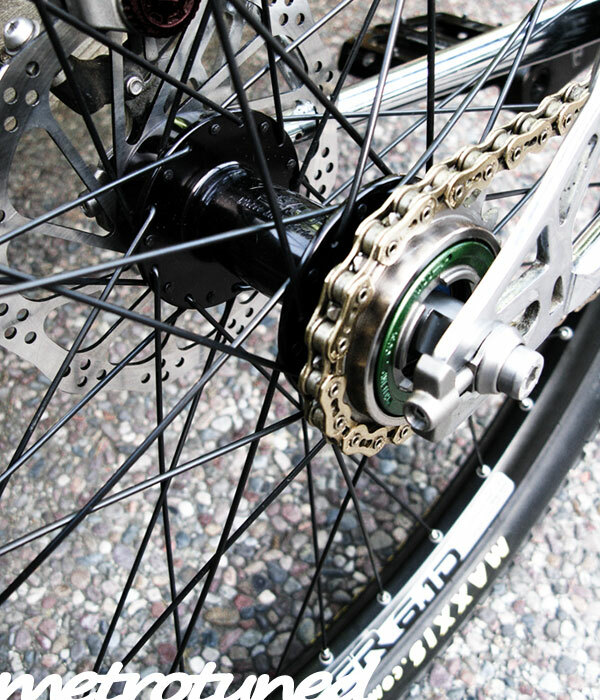 Have you tried the Surly tensioners? What about the MKS tensioners for 10mm? They are pictured in the above post by metrotuned, though his are installed inside out, but I don't think that matters. I have a pair that are a mite short, I want more thread contact, for my converted MUSS with 47in chain and a 34T oval with 18T WI Eno. The track nuts work fine by themselves thankfully. Maybe those might work? If I go to a WI Eno rear those would be my choice. I am running the Surly Ultra News on my fixie, which run the same knurled bolt on axles as the Pauls I believe... I have never ran tensioners, and my rear wheel gets worked over with all the pop skidding and low gear climbing. If you run QR then tensioners are a must, but with the knurled bolt ons I have never ran into any issues with slippage. Should work fine with any sort of chain tug with a flat face for that brass washer to sit. The Redline tugs on my Monocog come to mind and work great with the large washers with my bolt on Hope ss/trials hub.